Horace G. Lunt’s Concise Dictionary of Old Russian is a “bridge” dictionary spanning the lexical territory between Old Church Slavic and Modern Russian. For all its 40-plus years, it remains the best available short dictionary (some 5,500 entries) for providing access to some seven centuries of Russian literary production, including especially the standard texts that are read in courses covering the medieval period of the 11th-14th centuries. The Concise Dictionary of Old Russian is particularly strong in providing explications for words connected to Old and Middle Russian material and spiritual culture, especially ecclesiastical words, rhetorical terms, and items of foreign origin. Additionally, it is valuable for providing meanings for words that still exist in modern Russian but that have undergone significant semantic change or specialization. The lexical selection reflects years of Professor Lunt’s practical experience determining which words cause graduate students difficulty when reading texts in Old and Middle Russian. Oscar E. Swan’s updated version of the Lunt dictionary does more than take the 1970 work, originally reproduced as typed on an old-fashioned manual Russian typewriter, and reissue it in modern typography. His line-by-line editing corrects many inconsistencies and errors in the original, modernizes the Russian glosses (many of which were copied from 19th c. sources and had become obsolete), and improves on the system of cross-references and verb citation. Generous inflectional tables of Old Russian nouns, pronouns, adjectives, and verbs are given in a supplement. 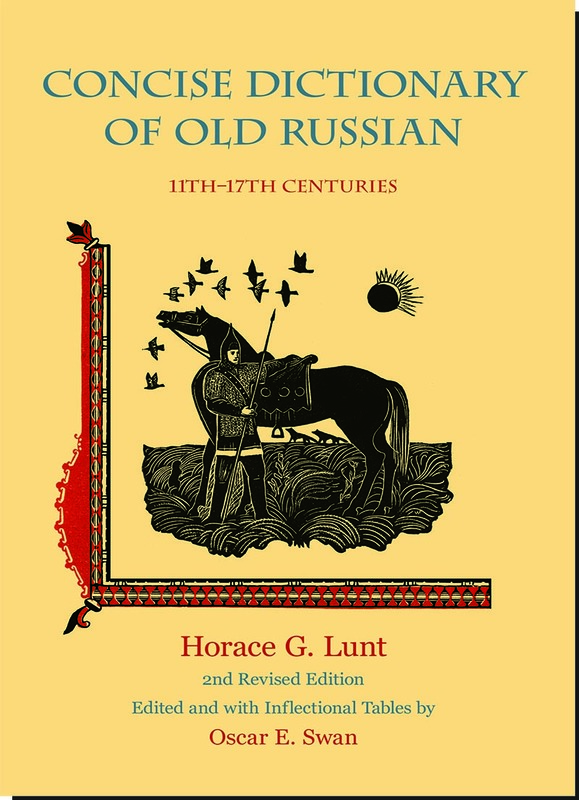 In the age of the internet, Swan’s version of the Lunt dictionary is available not only here, in hard-copy, but also in an electronic version (at http://lektorek.org), lexically interactive with glossaries of Old Church Slavic and Modern Russian, as well as a constantly expanding library of normalized medieval Russian texts.